settling in for the long day, two days, or three days that they're going to run . . ."
It was just getting light when I walked over to the Wrubliks' house at 6:45 AM on Monday. The forecast called for a sunny day in the 60s F. but it was only about 30� F. at the moment. Brrr. Jim was still sleeping snugly in our camper. I think I was quiet enough to not wake him up. I was to call him at 7:30 to be sure he was up. I figured I'd wait a few minutes after that, though, so the enticing aroma of his perking coffee would arouse him more gently than a jangling phone. I was almost as pumped as the runners who would begin their races this morning at 9 AM. Many of them who stayed overnight at Nardini Manor could sleep in because they were on-site and had already checked in on Sunday afternoon. About twenty more people still needed to get their timing chips, ID bibs, bags, and packets before they began running on Monday morning. They checked in early enough to attend the 8:45 pre-race briefing in the big tent so I was able to close up shop and watch the start of the race. Jim was already up when I called him. He had plenty of time to shower, get dressed, choke down some breakfast (he's not a big eater before races), feed and walk Cody, and take some items over to our personal aid table near the timing area. Since he planned to sleep in the camper several times the next two nights during his 48-hour race, he left most of his clothing, shoes, gear, and supplies there instead of at our table. He lost some time and put in extra distance going to and from the camper six or eight times but it was worth it to him (a tall hedge separated us from the track on the back side of the parking lot). 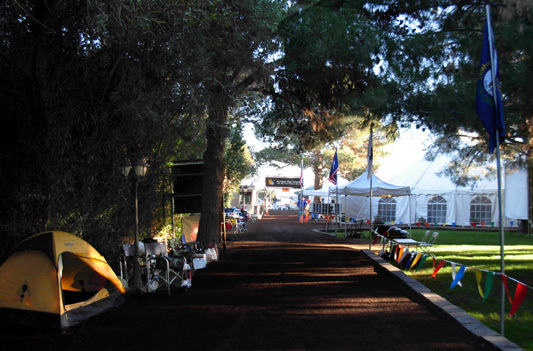 Runners have lots of choices at ATY re: where they sleep and if/where they receive aid besides the official aid station. 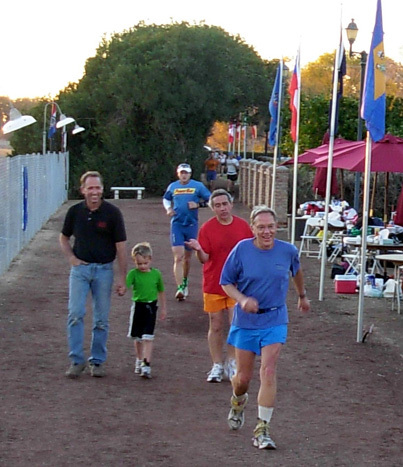 Several other runners also brought campers of various sizes to the race so they could sleep there. Two of the German runners flew in and rented a camper to use during their stay; they parked along the track at the end of the tall hedge and set up their aid table right outside their door. Very handy. Other runners slept in the backs of vans or SUVs. 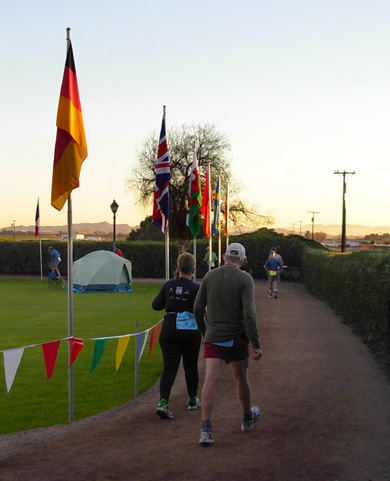 The majority of the 48- and 72-hour runners slept on cots or in tents on the lawn, in the new quiet tent, or in the huge heated tent during the race. Most of the 24-hour runners stayed awake all night and didn't need to bring sleeping bags or tents unless they were present at the race venue on other days they weren't running. During the 24 hours I ran on Day 3, I never went into our camper; I kept everything I needed at our aid table near the mailbox area. 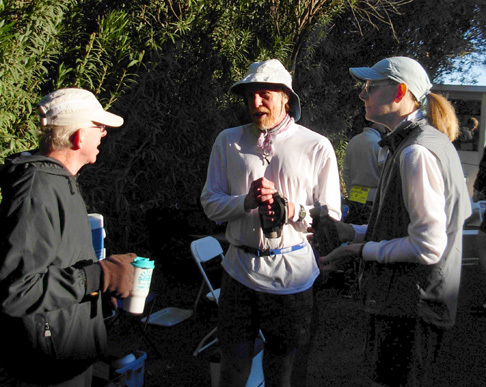 Jim (L) talks to Matt and Anne Watts a few minutes before the start. 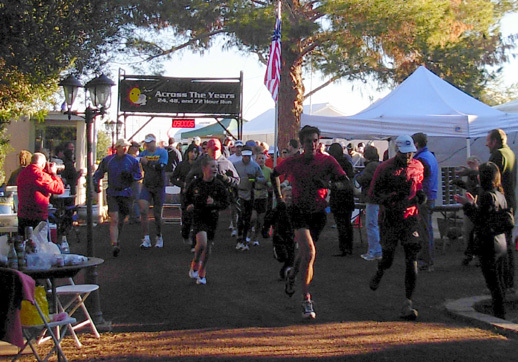 The runners soon came streaming out of the big heated tent from the pre-race briefing and did last-minute preparations before the start of the race. It was the first I'd seen Jim since he got up. We hugged and kissed each other good morning. He seemed calm and eager to start his newest adventure: his first 48-hour race. He'd be in new territory after 35 hours. 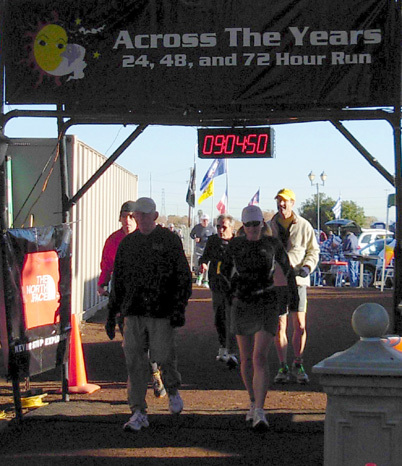 We talked with Anne and Matt Watts, who were both running the 24-hour race, and other friends. Then Jim wandered over to the start as the clock ticked down to 9 AM. 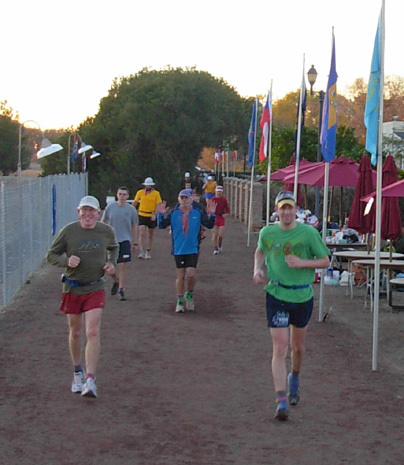 A few hardy runners wore shorts and/or short sleeves but the majority were in pants, long sleeves, and even gloves in the chilly air. In races this long, even most of the 24-hour runners would start out slowly to warm up their muscles. It'd be downright foolish for the 48- and 72-hour runners to start out too fast. That didn't stop 24-hour runner Jamil Coury from bolting around the track his first lap, but that was just for show! I was hoping there would be a hard-fought battle on Day 1 between Jamil (age 23) and his two younger brothers, Nick (21) and Nathan (18), but it was little brother who was the only one in the family to top 100 miles. Jamil and Nick stopped after reaching 57 and 55 miles, respectively. 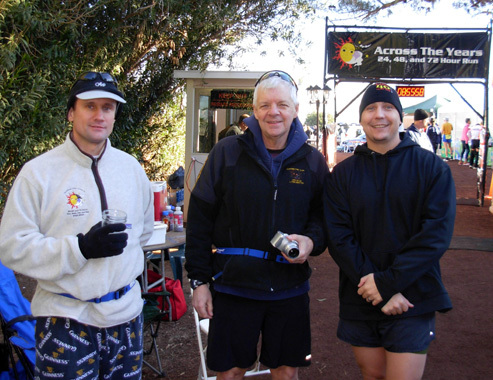 Their father Paul (55) ran on Day 3, accumulating 53 miles. Wife and mom, Patty, was crew and Volunteer Extraordinaire throughout the race. She and her sons stepped in to work long hours in the aid station on Day 3 (and during the night) when there was a shortage of volunteers. Thank you so much, Coury Family! Some runners (above) started off fast. Most walked until they began warming up. Jim's on the left, below. During his taper before a race, when he has a good idea of his current potential, Jim likes to research the splits of other runners who have finished the race in about the same time as his intended goal. He usually sets two or three goals from bare minimum time (or distance in a fixed-time race like ATY) that he'll be satisfied with to the time/distance he could possibly reach if everything goes perfectly (the best-case scenario or fantasy goal). Then he prints out and laminates ~ 4x5" split charts to carry with him so he can determine how he's faring on that continuum during the race. For ATY he printed out two 8x11" split sheets, one for the camper and one for our aid table. One side of the sheet was for Day 1 (as shown below), the other side for Day 2. 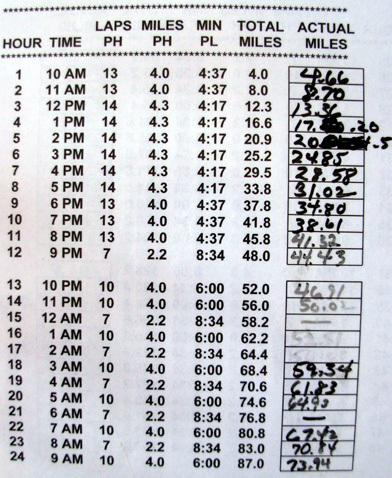 He included the hour, time of day, goal laps and miles per hour, goal minutes per lap, goal total miles, and a blank column for actual miles at the end of each hour. He used a Sharpie pen to fill in the last column most of the 48 hours. The ones he missed were mostly hours he was asleep. For this race Jim put only the splits for his best-case scenario goal because he thought that would motivate him the most: to run and walk 48 miles the first 12 hours (9 AM to 9 PM), 39 miles the next 12 hours, which were mostly at night (9 PM to 9 AM), 37 miles during Day 2 (9 AM to 9 PM), and 32 miles the last 12 hours (9 PM to 9 AM) for a grand total of 156 miles. His more realistic goal was 120-130 miles but he'd basically be satisfied with anything over 100 miles because he'd never been "out there" two nights before and 100 miles is the most he's ever gone in one race before. As you can see in the chart above he was a little ahead of schedule the first four hours and then slowly fell behind his best case scenario splits the rest of Day 1. He knew this event would be a learning experience since it's his first 48-hour race. I don't think he started out too fast; he ran/walked his first lap in 4:50 minutes and the second in 4:42, then began running and walking a little faster pace. The fastest 500-meter lap split that I see on the first day was a brisk 3:16 minutes around 1 PM but most laps where he didn't stop to eat, drink, go to the bathroom, etc. were in the 4-5 minute range (12-15 minutes per mile). You can see his splits for entire race here. The second column shows how fast he walked/ran every one of his 374 (!!) laps. It also shows his pace per minute, kilometers per hour, elapsed time, time of day, total kilometers, and total miles. Jim (L) and Gillian Robinson, both in the 48-hour, finish their first lap in 4:50 minutes. 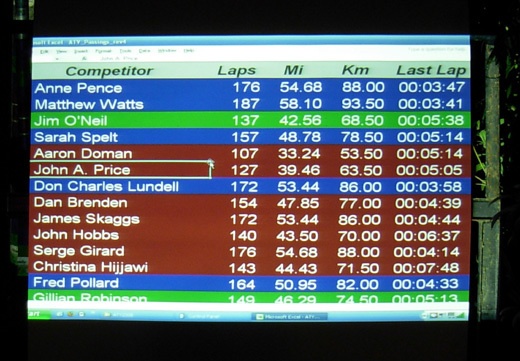 This is one of the great features of ATY: complete and accurate results during and after the race. 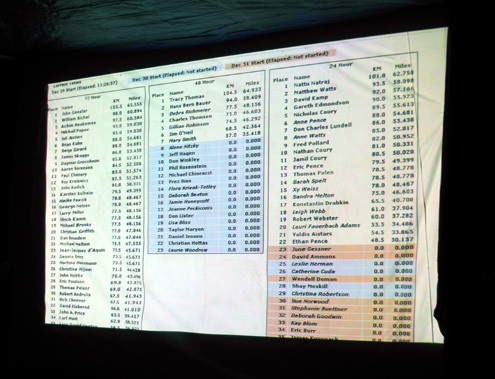 Runners get most of this information on screens at the end of each lap and on a large leader board projected from the computer under the canopy shown in the next photo. Viewers anywhere in the world could see much the same thing on the internet, almost in real time, and set the refresh rate from 15 seconds to two minutes. Ironically, when I was in the camper on Days 1 and 2, I got on-line several times to download e-mail and look at the standings, lap splits, and web cam! When I needed to be inside it was more efficient than walking over to the timing area to watch the runners and the various screens live. Jim did the same thing on Day 3 when I was running. The two guys in the foreground were looking at the standings on their computer. The real leader board was behind them, thirty feet away! That's pretty funny, and the reason I took the photo. All the results at ATY are verified within a few days after the race and the final version is kept on the web site for future reference. To find lap splits for other runners, click first on the results or "standings" link for the 2008 race, then the runners' numbers (the links on their names bring up auto-biographical information). It's easy to see how fast and slow some of their splits are or to tell when they are off the track for any length of time to eat, sleep, work on blisters, etc. Jim's splits indicate he had at least ten lap times of 8 to 16 minutes each on Day 1, with a longer lap time of 1:22 hours after 11 PM to sleep. This is good information for him to have as he plans his strategy for the race next year. circle in front of the house late in the afternoon of Day 1. Yes, he may do the 48-hour run again to see how much he can improve his distance. It's called "unfinished business." His main challenge is figuring out his sleep breaks and how to prevent the bottoms of his feet from hurting so much. He has about seven months to decide which race he wants to do at ATY next year: 24, 48, or 72 hours. Foot problems resulted in some of Jim's long lap times the first afternoon and evening. He switched shoes in the camper three times during the race, a tactic that is often advised so hot spots, blisters, and other problems don't develop. He started off in Asics 2130 trail shoes until one of his feet began to hurt. He discovered that a soft gel-filled "sleeve" that he's used successfully several times to prevent blisters on his toes had slid off his little toe and was actually causing a hot spot where it was bunched up. Since the bottoms of his feet were starting to hurt already, he switched to a more cushiony, flexible pair of Asics 2130 road shoes with a wider toe box. They helped until the constant repetitive motions turned the hot spot into a blister. He popped it later the first evening, soaked it in Epsom salts, taped it up, and put new socks and the same shoes back on. That held him through the night. Jim's and my approaches to ATY differed in other respects than our race strategies (his detailed pace chart, above, versus my very casual approach, which I'll explain later). 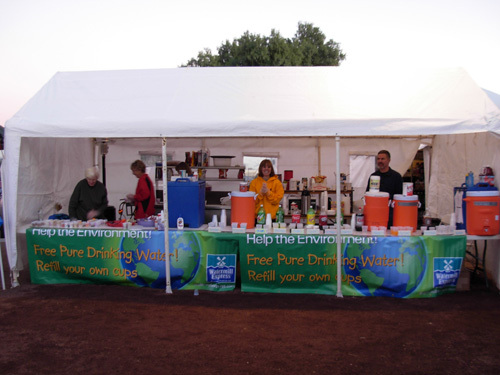 We also had different plans for using the camper, the race aid station, and our personal aid table. Part of that was due to the varying lengths of our races (one day vs. two) and part of it was due to general preferences and personality differences. My attitude toward racing has become much more casual the past year or two. Neither of us is "right" or "wrong." We just approach some things differently. Since Jim knew he'd be sleeping in the camper several times during his 48-hour race he just left his clothes, shoes, and most of his supplies in the camper. There wasn't any other logical place for him to change clothes, and he had better light in the camper to work on his toe than anywhere else. He was in and out of the camper about eight times during Days 1 and 2. My strategy re: the camper was to avoid it entirely, if possible, during the 24 hours I was on the track. I figured I was able to do it last year and I should be able to do it again. Mostly I was trying to save time by having everything I needed at our aid table. That wouldn't have worked if I was in the 48-hour race, though. Ray Krolewicz (red shirt) behind Ulli Kamm (blue shirt) on Day 1. Our nutritional plans are also different at races. 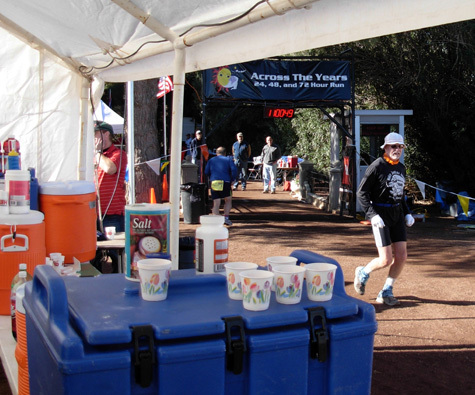 Jim uses the beverages and foods available at aid stations a lot more than I do. At ATY he didn't put much of anything to eat or drink at our table. I had almost everything I needed there for 24 hours, except for some hot food I ate during the night when Jim was asleep in the camper and I didn't want to wake him up. Again, if I'd been in the 48-hour race I probably would have needed more solid food from the aid station than I needed for "only" 24 hours. Jim primarily used Hammer Nutrition's Heed at the aid station for his energy drink, supplemented by the Sam's Club generic version of Boost that he kept in a cooler at our table. He also drank water and soft drinks from the aid station and one Starbuck's frapuccino in our cooler. He went through only a couple 5-ounce flasks of our Hammergel supply (although he had a bunch more in the cooler) and got most of his calories from soups and solid foods at the aid station. He enjoyed the race's smorgasbord -- for example, grilled cheese sandwiches for lunch, chicken cordon bleu for dinner, quesadillas for breakfast. ATY offers tasty selections, which vary from day to day. My nutritional strategy was to rely primarily on my own Hammer Perpetuem energy drink and Hammergel, which I kept in our cooler. Both supply easily digested calories and are quick to consume. I didn't get any fluids from the aid station, even water. I had about three gallons of cold water in a big blue cooler on our table and quickly mixed up a new bottle of Perp as I needed it. Since Perp has protein and fat in it, I got away with only occasionally eating hot soup or other foods from the aid station for my one-day run. The breakfast, lunch, and dinner foods offered at the aid station were tempting, believe me, but I was focusing on forward movement. Jim's strategy worked well for him; he had plenty of energy during most of the race and didn't get dehydrated. My strategy worked equally well for me. Different strokes. 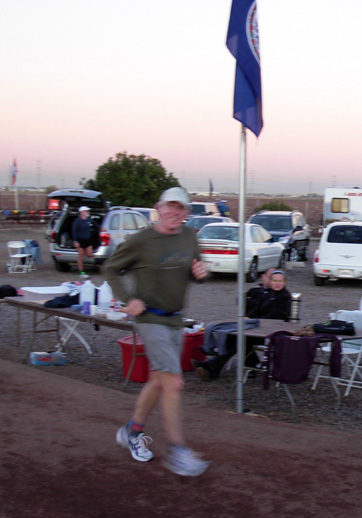 I hung around our aid station table near the timing booth while Jim walked and ran his first few laps. 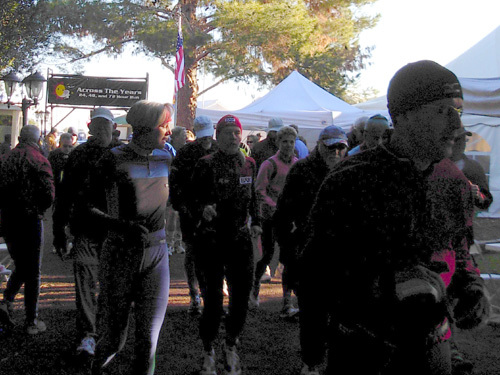 I took some photos, encouraged the runners, and enjoyed the beautiful morning. Then I headed back to the camper to eat breakfast, take a shower, give Cody some attention, and get on the computer for a little while before my next volunteer assignment: working a shift in the kitchen and aid station from 11 AM to 3 PM. It was great fun to watch Jim's mileage creep up as the hours passed. Neither of us required much crewing assistance since the aid station was so well-stocked, we had our own aid table, and the camper was close, but it was still nice to crew and be crewed as time allowed. When I was in the aid station, I simply helped crew for everyone wanting to eat or drink, not just Jim. Like the other volunteers on my shift, I did a little bit of everything in the kitchen and aid station: helped make new batches of Heed, filled cups with a wide variety of beverages, learned how to mix German runner Martina Hausmann's cranberry juice-and-water ratio exactly right in her bottles (she had no crew), made peanut butter sandwiches with and without jelly, served grilled cheese sandwiches to passing runners at lunchtime, made instant soup upon request (delicious homemade potato soup was prepared later in the day), and another one of my favorite jobs, encouraging the runners. Since it was still pretty early on the first day of the race, most folks were in good spirits and feeling frisky -- but encouragement is still usually welcomed! The most effective encouragement is probably from crews, friends, family, and volunteers who are there in person at the race. Also very popular at ATY is the "Better Than E-Mail" feature. Anyone with an internet connection can send sincere and/or humorous words of support to their favorite runners through a link on the race website. The messages accumulate on another page where they can be read by anyone in cyberspace (so it's best to be somewhat discreet!). When Jim and I weren't running, we could read them on-line in the camper (and I sent some on the first two days to Jim and friends who were out on the track). Paul, Rodger, and other volunteers print out every message every couple of hours and put them in the runners' individual mailboxes so they can read them during the race. Most of the runners love this feature, especially deep into the race when their enthusiasm lags and everything hurts and they start wondering why the heck they are out there! (It sounded like a good idea at the time . . . ) It's fun to watch other runners as they circle the track reading their messages and reacting to them. Some of the messages are very funny and all are motivational at some level. We are always grateful to the people who take the time to think of us and send us short notes during the race. Unfortunately, we didn't remind as many people about the mail feature this year and didn't get as many messages as last year. But the quality of the ones we received made up for the lack of quantity. Thanks to everyone who sent regular e-mail or "better than e-mail" notes. The lap screen shows Jim has run 42.56 miles so far. It was 8:25 PM on Day 1. 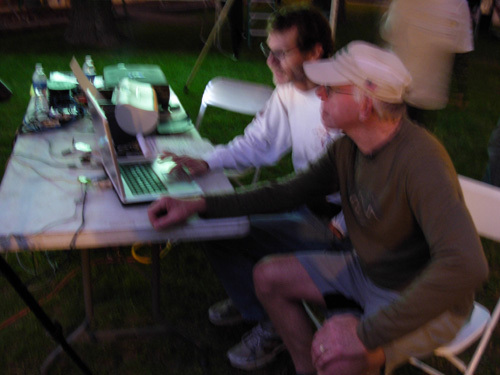 At the same time, the leader board showed Jim was in 6th place of seven runners in the first 48-hour wave. Jim moved up and down in the standings as the second wave in his race accumulated miles on Days 2 and 3. Jim was facing quite a few "unknowns" in his first 48-hour race. One of the biggest was how to manage the sleep he'd need -- when, how often, how long? 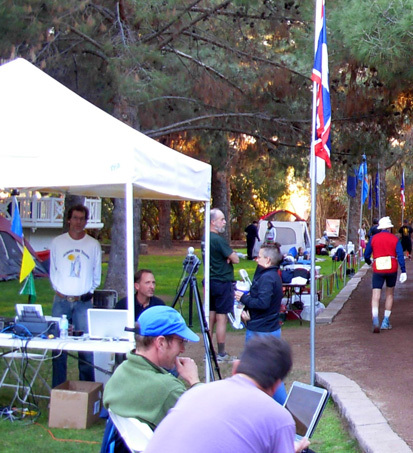 He researched this aspect of multi-day races as much as he could in the months prior to the race by reading race reports, reading training strategies printed in UltraRunning magazine, and looking at the splits of ATY 48-hour runners who ran in the middle of the pack (a great use of the website data I mentioned earlier in this entry). He also decided to contact some of them individually by e-mail. As you'd predict, the best information he received was from friends who have done the 48-hour race previously at ATY or elsewhere. The problem was determining which strategies would work best for him. Some runners set a particular distance or time goal before taking their first sleep break. Others said it was better to lie down when they first felt sleepy because sleep had totally eluded them when they waited until a specific time or distance goal. Some recommended taking only "power naps" of 20-30 minutes duration so as not to get into the REM cycle (too fuzz-brained when you wake up in that cycle). Others believed they did best with several 2-3 hour naps (after passing through the REM cycle). 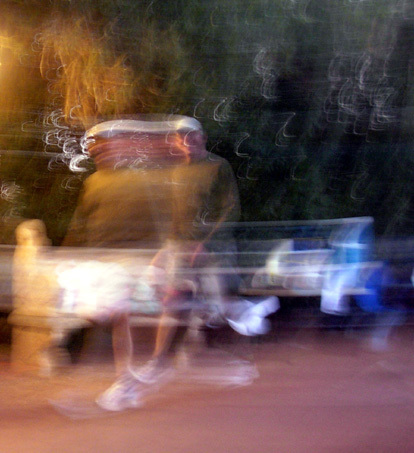 Since ultra runners are an experiment of one, Jim had to find out for himself what worked best. Kind of like figuring out which run-walk strategy is best. It varies throughout the race. What works well on Day 1 probably won't work well on Day 2. Live and learn. Even though he didn't know the exact MO he'd use for sleeping, Jim did know that he needed something simpler to set than an alarm clock when he was sleep-deprived on the second night. So he found an inexpensive timer that was very easy to set and used that for each nap. He had his clothes, shoes, gear, supplies, pillow, and blankets organized for easy access in the living room. He slept in his recliner, a strategy designed to discourage over-sleeping. It also allowed ME to sleep better the two nights before my race. Jim and RD Paul Bonnett work on web cam issues late in the evening on Day 1. We talked a little bit before he returned to the track. He had reached the 100K mark, one of those "milestone" distances, around 4 AM and was up to 65 miles when he came in for his second nap. Jim told me about the neighbors' roosters crowing at 3 or 4 AM, way before daylight. I never heard them until it was my turn to walk all night.